We have done some great eating over the weekend, none of it terribly well thought out but all of it absolutely delicious! 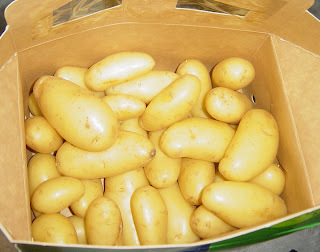 Friday I was lucky enough to get hold of some new seasons baby potatoes so planned dinner around them. I wanted them as unadorned as possible and so boiled them and finished them with a little olive oil and black pepper. 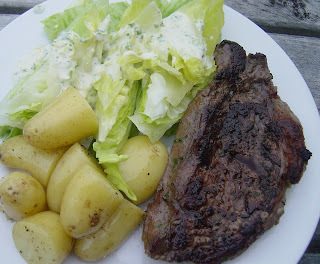 I teamed them with a simple barbequed steak and some gorgeous blue cheese dressing on wedges of iceberg lettuce. The dressing turned a plain meal into something so much better, it was a basic vinaigrette made with olive oil and white wine vinegar, whizzed up in my nifty mini processor with a block of blue cheese, garlic, mustard and a couple of tablespoons of sour cream. The healthy factor went down a notch or two by its inclusion but the yum factor went through the roof! I also picked up a nice big pork roast with a plan to roast it for my husband who loves roasts and is poorly catered for by me in that department. I have never been into cooking roasts, again because my mother does it so well and mine just never measure up! Needless to say my husband is always thrilled with an invite to my mothers for a roast, as he loves them! I don't think I have ever roasted pork for him so thought I would give it a go. As always plans change and after pondering what to serve with it, I did my usual "poll the mob" on Violets Pantry and was encouraged to try Nigellas '24 hour pork', a recipe in Nigella Bites: From Family Meals to Elegant Dinners, Easy, Delectable Recipes for Any Occasion which is basically cooked in the oven for 24 hours! Well her piece is 9 odd kilos and mine was only 2 so I reworked this as '8 hour pork'! You basically smear olive oil, rice wine vinegar, garlic, ginger and chilli all over the pork and put it in the oven at 120C. Could not be simpler! 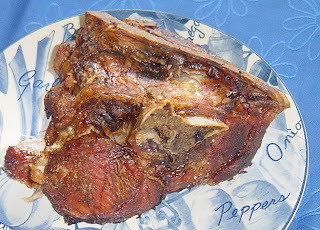 I was off out shopping for the day so popped it in the oven and away I went, arriving home to the most gorgeous smell and melting off the bone pork. 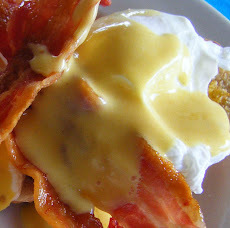 I can't recommend this recipe highly enough, it so easy and sooooooo delicious. I ended up taking it to my mothers as part of a pot luck dinner where it got devoured, not a skerrick left over even for a sandwich! My only adjustment would be to eat it straight away, as we let it sit for about an hour and a half before eating it and it dried out a lot in that time. It was still great though. For dessert a friend of my mum's had brought along a Rosewater, pistachio and raspberry meringue roulade which was so gorgeous, hints of turkish delight and all that sweetness with the raspberries worked so well. 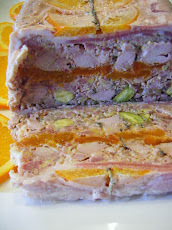 The recipe came from November's Taste magazine, but I see they haven't added it to their website so will write it out as it is well worth trying. Preheat oven to 150C. Grease base of a 36 x 26 cm Swiss roll tin with the oil and line with tinfoil. Put the egg whites into a spotlessly clean bowl and whisk until stiff peaks form. Beat in sugar a couple of tablespoonsful at a time, until meringue is thick and glossy. In a seperate bowl mix together cornflour, vinegar and rosewater to form a runny paste and lightly whisk into the beaten meringue mix. Spread the meringue mixture into the pepared tin with a palette knife, making sure it is spread evenly into the corners. Sprinkle the top with the pistachios. 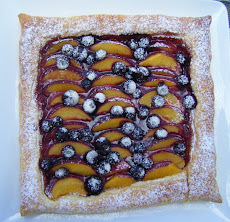 Bake in preheated oven for 20-25 minutes, until firm but still soft in the centre. Leave to cool completely on a wire rack. 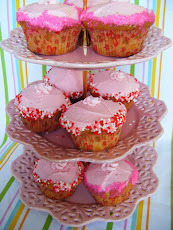 Whip cream and extra rosewater to a thick but not too stiff consistency. Turn the meringue out onto a large fresh sheet of tinfoil. Gently peel away the foil from the meringue. Spread with cream, avoiding the edges, and scatter evenly with raspberries. With the help of the tinfoil roll up the meringue. 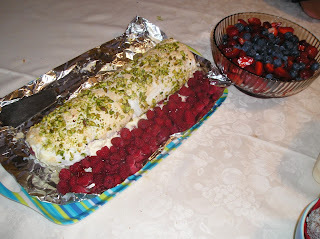 Wrap roulade in the foil and chill in the fridge for 30 minutes. Cut into slices and serve with extra raspberries. Our meal tonight was a simple and yummy salad again from an old Taste magazine. 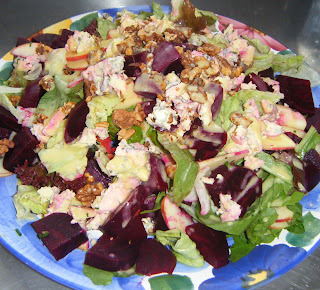 Sticking with my penchant for beetroot right now we had a Beetroot, Apple and Blue Cheese salad with walnut cider dressing. 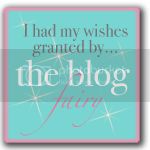 A fab combination that I will definitely be repeating! Put the mustard into a small bowl and whisk in the vinegar. 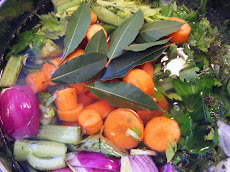 Pour the oils in slowly and whisk to emulsify the dressing. Season to taste. Place the drained beetroot on a plate lined with a paper towel, cover with another piece of paper towel and pat to absorb as much juice as you can. Leave beetroot this way while you prepare the other salad ingredients. Cut the apple quarters into fine slices and place in a large bowl. Cut the celery on an angle into thin slices and add to the apples. Add radicchio, watercress and lettuce leaves. Pour the dressing over the salad mix. 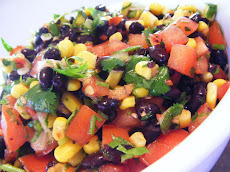 Use your hands to toss lightly until the entire salad is coated.Arrange salad mixture on a large platter. Add the baby beetroot and crumble the blue cheese over the top. Add walnuts and sprinkle with sliced chives to serve. 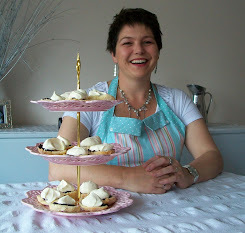 Hi Linda - I love the slow roasted pork, so easy and so delicious :) Love your photos, that meringue looks gorgeous. 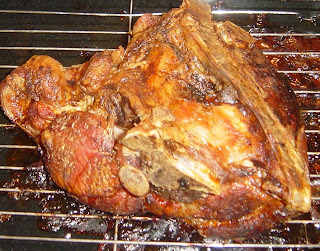 That pork looks so yummy. I love the look of the meringue roulade. I've never heard of meringue done that way before. A wee bit different to the usual pavlova. A must try.